My email and password are correct, why can't I log-in? How accurate are the colors on the website? Having problems viewing Kit fabrics or Book pages? Having problems printing free patterns? 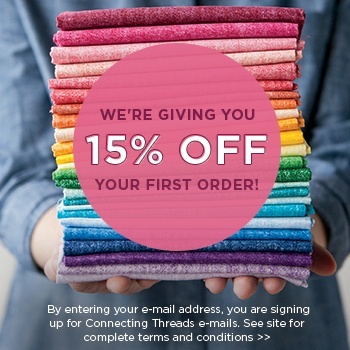 How do I remove myself from the Connecting Threads catalog mailing list? I forgot my email address, what do I do? If you cannot remember the email address you use to log in, you can contact Customer Service and request the email address you used to register with us. However, if that email is no longer active, you will need to re-register using a new email address and password. I forgot my password, what do I do? Enter the email address you registered with into the Password Reset feature. We will send a link to that email address to your Account Page so you can create a Password. Please make sure you are accepting emails from our website, so your password email is not marked as SPAM. Print your cart so you won't lose this information. You need to add www.connectingthreads.com to your Allowed Websites. Your Security Setting can be no higher than medium high. Delete all Connecting Threads cookies (listed as CT). Close your browser and re-open to establish the new settings. All of our transactions are in U.S. dollars. We accept Visa, MasterCard, DISCOVER, and American Express as credit cards. We also offer Pay Pal for your convenience. In addition U.S. Residents can mail us a check or money order denominated in U.S. dollars. Please note there is a $15 service charge for personal checks returned for NSF. Sorry, no C.O.D. or purchase orders. All fabrics on our website ha been carefully photographed and color-corrected for accuracy. However, every computer screen is different so we are unable to guarantee the accuracy of the images as viewed on your computer. Go to My Account and log in using your original Email Address and Password. It will take you to “Edit your existing member account” Go to the first section marked “login information" and change your email address in the designated field. Review the other information and then click the SUBMIT button. We do not offer wholesale prices at this time. To view this information you need to turn off your pop-up blocker on your browser software. Note: This function is usually listed under the Tool Menu. Having problems printing free patterns? To print free patterns you need to turn off your pop-up blocker on your browser software. If you are receiving a Connecting Threads catalog in the mail, and you prefer not to, fill out the Stop Receiving the Connecting Threads Catalog in the Mail Form, and we will omit your name from future mailings. 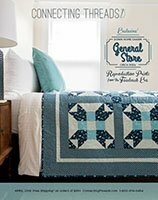 We generate our mailing list several weeks in advance of a catalog being mailed, so you may still receive one catalog after filling out this form, depending upon where we are in our mailing process. If you are a current customer, you will still be able to order our products on the phone, or on our webpage. Once you purchase a download from us, the link to open it is found in your first email confirmation. We also put it in your pattern library that is located at the top of the home page. You will need to be logged in or have your order number to view/print your pattern.